The Old Trails Museum is featured in this terrific video produced by Tiffany Ruhl for the Smithsonian’s Museum on Main Street division: http://www.youtube.com/watch?v=TYY0lqV_x4g&feature=youtu.be. Tiffany taught folks from each of Arizona’s host sites how to set up the Smithsonian’s Journey Stories traveling exhibition at the Installation Workshop, held on June 19 at La Posada Hotel in Winslow, the first stop on the Arizona Humanities Council’s statewide tour. Both Journey Stories and the museum’s companion exhibit, Journeys to Winslow, will be on display through August 4. Follow this “News” feed and “like” the Old Trails Museum on Facebook for the latest details on all Journeys to Winslow exhibits and programs. Journey Stories is a Museum on Main Street collaboration between the Smithsonian Institution and the Arizona Humanities Council, with support provided by the United States Congress. The Old Trails Museum is hosting the Smithsonian’s Journey Stories exhibition at La Posada Hotel from June 22 through August 4, 2013. Winslow is the first stop on the Arizona Humanities Council’s statewide tour of this traveling exhibition, which examines the roles that migration, travel, and modes of transportation have played in American society. 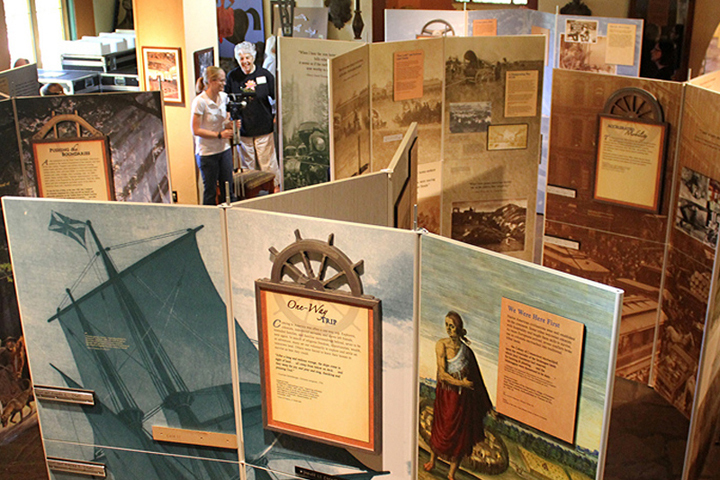 The Old Trails Museum also developed a local companion exhibit, Journeys to Winslow, to explore Winslow’s many connections to the historical themes in the Smithsonian exhibition. 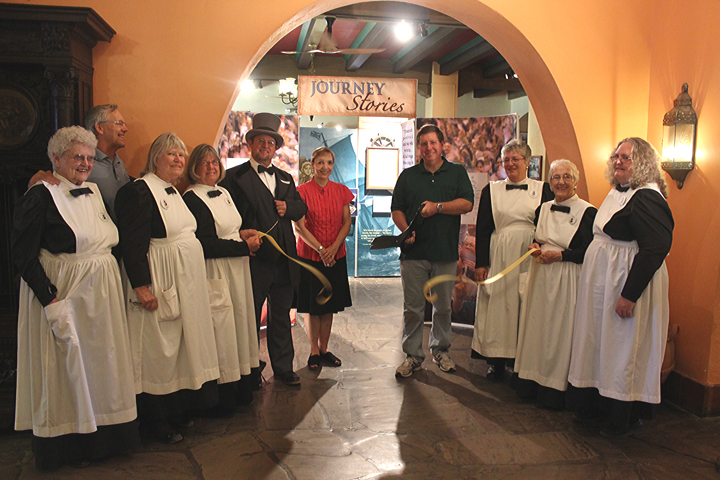 In this image, Winslow Mayor Robin Boyd cuts the ribbon at the Grand Opening as Old Trails Museum Director Ann-Mary Lutzick, La Posada owner Allan Affeldt, and the Winslow Harvey Girls and “Fred Harvey” look on. La Posada General Manager Dan Lutzick took the image and also serves as the venue contact for Ann-Mary, who is the Project Director for Journey Stories in Winslow. The Old Trails Museum is also presenting a speaker series on Thursday evenings at 7 pm in La Posada’s Ballroom, and many community organizations are also hosting programs for Winslow’s tour stop. Go to the Old Trails Museum’s “News” page or “like” the Old Trails Museum on Facebook for the details on all local exhibits and programs. Journey Stories is part of Museum on Main Street, a collaboration between the Smithsonian Institution and the Arizona Humanities Council. Support for Museum on Main Street has been provided by the United States Congress.